This 41ft Ronin Sportfisher out of Pez Vela Marina in Quepo is powered by Twin Man 610hp diesel engines. Experienced Captain Minor Oporta, whose latest major triumph was a first-place finish at the 2017 Pelagic Rockstar Offshore Tournament, is at the helm, assisted by an English-speaking crew. 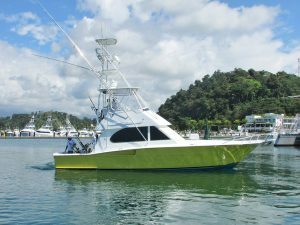 She features an open A/C cabin; staterooms; full marine head; marine radio; a complete range of electronics including GRP and fishfinder; a fighting chair and outriggers; a complete range of tournament-class conventional light and heavy tackle; and all the required safety equipment. Also available for overnight trips to Seamounts.